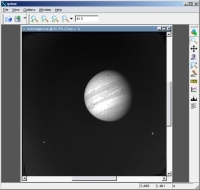 This program will take in raw image files from the Voyager spacecraft mission and import them into Isis formatted cubes. The input files are compressed Planetary Data System (PDS) formatted Voyager Experiment Data Record (EDR) files. The output cube will contain tranlated labels in pvl format with instrument, archive, bandbin, kernel, and nominal reseau information. Jeannie Walldren 2009-03-23 Modified the Makefile in the app test to ignore particular lines when comparing labels. Removed the orginal extension from the name of the temporary decompressed file output by a call to vdcomp. Modified error message for accuracy. Mackenzie Boyd 2010-04-30 Modified StartTime in labels to remove Z from end. Modified naif frame code for all cameras to be -100 (-32001 -> -32101) from what they were previously to match updated ck and fk kernels. Added significant changes which affect the start time and image number for improved accuracy. Mackenzie Boyd 2010-07-29 Added keywords Camera_State_1 and Camera_State_2. Mackenzie Boyd 2011-01-21 Added support for .img files. Stuart Sides 2012-05-05 Added Center and Width keywords to the BandBin group. Marjorie Hahn 2017-08-09 Added label preparsing to modify corrupt labels. Fixes #4421. Christopher Combs 2018-01-19 Made changes to allow merge of two voy2isis tickets. References #4421, #4345. Use this parameter to select the Voyager PDS EDR file to be imported. These files are in compressed format and have the form cnnnnnnn.imq where "nnnnnnn" is the FDS count. When selecting input files that are decompressed, set this parameter to the LBL file that points to the corresponding IMG. 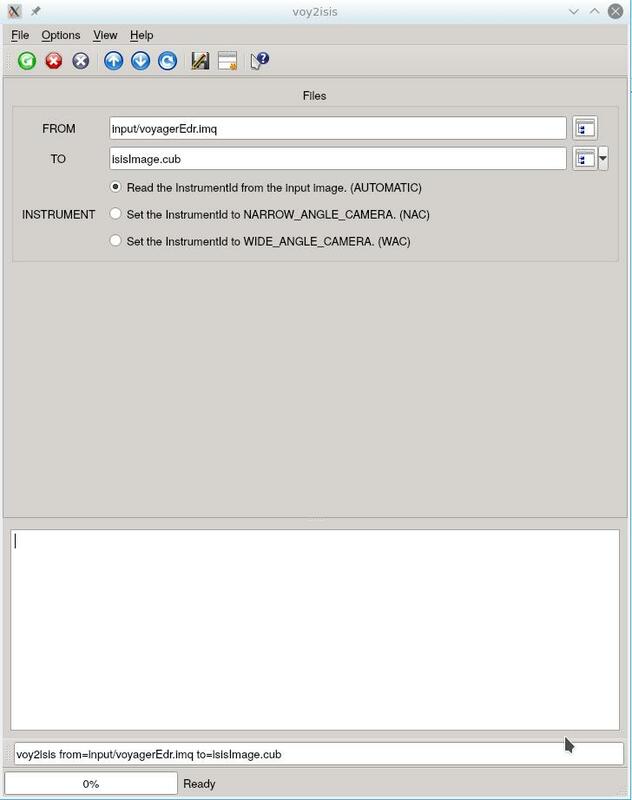 Use this parameter to select the output filename for the imported image. 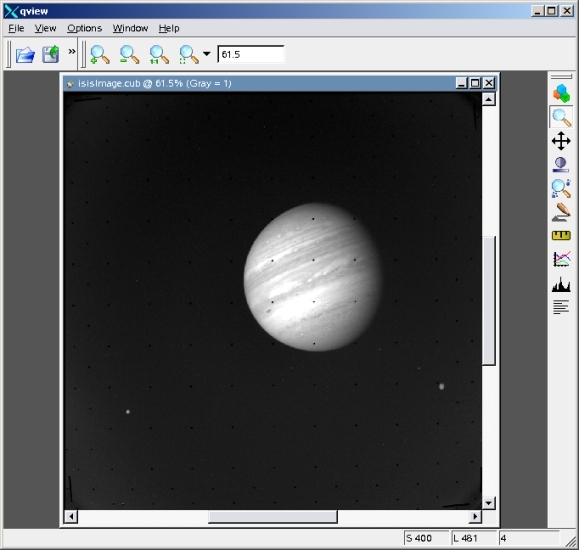 This example shows the use of voy2isis to ingest Voyager EDRs and output Isis3 cubes. This example shows how to import with voy2isis. Both parameters must be used. This is the label from the output cube showing the Instrument, BandBin, Kernels and Reseaus groups imported. Screenshot of the image in the Isis qview application after it has been ingested.